A researcher obtained Norris baptism records for me several years ago, but he sent no other families’ records. Notice there is a Mary Mackerill listed in Ballinahone [near Armaugh, south of Maghera—pronounced “MA-ha-RAH”-in the Church of Ireland records]. Her parents are listed as well. I believe this Mary Mackrell to be the first wife of Robert Norris (1785-1867)4. I will let you draw your own conclusion!!! 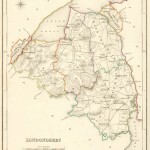 Interesting that the Norrises and Mackrells lived so close together in Derry County. I continued to research the database and believe I have uncovered what could be a “nest” of Grays, my mother’s maiden name, and related families that I have been searching for in Ulster. This article is a brief review of what we think we know about the origins of four families in particular with American roots in West Deer Township, Allegheny County, PA: Gray, Norris, Mackrell, and Dowling. While the finding may be speculative, we believe it’s the methodology and correlations with regard to names and locations that are important. My great-grandfather (X3), James Gray (b.abt. 1780), emigrated from, we believe, Derry County, Northern Ireland, to Western Pennsylvania in the late 18th century. While we can’t be absolutely certain at this time what parish James resided in, we know he sailed as a young lad with the Boyd family from what is today the Port of Londonderry. Going back a century and a half before James’ birth, we find the 1630 Muster Roll from there containing the names of both Joseph Gray, a swordsman, and John Norris, no particular weapon. These men and many others with Pearce and Gray-associated Scots-Irish names would have been prepared to defend the port city and region. As for the church registries, almost all of the Grays are found in Presbyterian parishes. While a handful of our surnames are found in Boveedy, Curran, Kilrea , Swatragh, Tobermore, and Knockloughrim, the majority are listed in Maghera. In the lists of marriages, the first names could be from the family tree or our annual Gray reunion: Robert, Samuel, William, James, Annie, Sarah, Maria, and so on. What strikes me, however, is how young the couples are, ages 17 to 24. Almost all the men are farmers. One funeral in the fall of 1892 stands out; little Lizzie Gray, age 5, of Ballymacilcurr died of what the doctor listed simply as “diahorrea.” In studying a century of various church registrations, I see men and women, sons and daughters being widowed and remarrying, having children baptized, being buried in the churchyard, and some even changing churches. Which ones are we related to? At this point, we can only wonder. Perhaps, in the future, a professional genealogist can answer that question. According to the 1831 Irish census, he [Robert, Sr.] was living near a James and William Norris, who are probably his brothers. His first wife was named Mary [last name unknown]. She bore him a son, Robert Norris, Jr. in 1784/5. Mary Norris either died in childbirth of shortly thereafter. Robert, Sr. remarried and had several other children. Perhaps then Catherine Dowling was not Robert, Jr’s mother after all. There is still much confusion surrounding the surnames of the Catherines and the Marys. In 1845, in Kilrea, a Robert Norris was buried at 81 years of age. This puts his birth in 1764. What is his relation to our Robert, Sr.? The 1911 Census of Ireland lists several Norris families still residing in Swatragh. This census also lists MacKrells in nearby Castledawson. Let’s look at that family now. The Church records the burial of a Catherine Mackerill at age 76 in 1883. She would have been born in 1807. Could she have been a relative? Or could this have been the wife of Robert Mackerill of Ballinanone? He married Catherine Gibbins at St. Lurach in 1822. Incidentally, eighteen months later, an Archibald Mackerell of the same village married Jane McClain in the same church. As Dan Norris implied, the coincidences of names and proximities of residences points to a strong correlation to these families in Northern Ireland and our own in America. Read more about our family in “Introduction: MacKrell.” Now, let’s investigate the more mysterious Dowling name. We have found that the true Irish Gaelic surname Dowling is more common in the southeast Emerald Isle near Kilkenny. 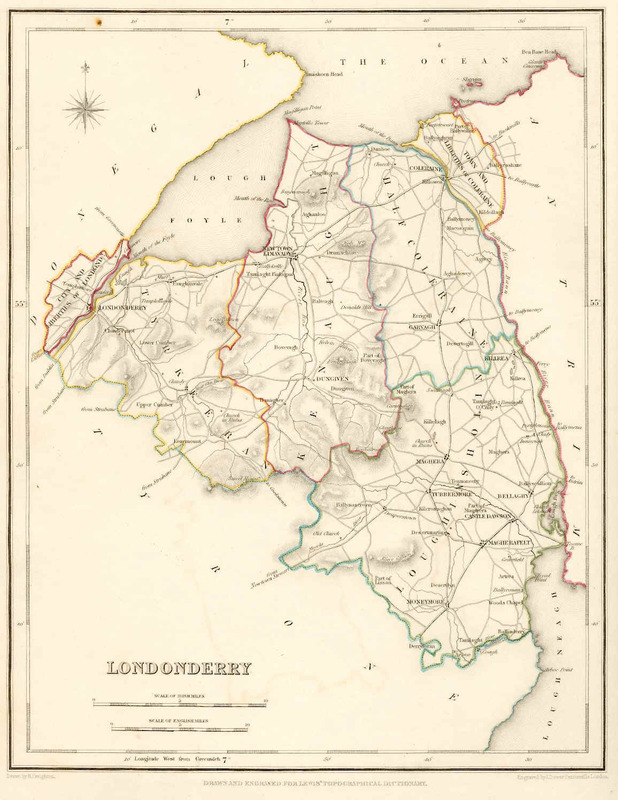 In fact, the original combination of words for the surname, Dubn (dark colored) and Laodh (for calf), is not that different in sound and meaning for the capital city of the Republic, Dublin (meaning “dark pool of water”), which is just east of Kilkenny County. Public records tell us that King James I, in 1609, transplanted several Dowlings from Kilkenny to other southern counties, Limerick and Kerry. Ironically, along with the Dowlings of Kilkenny on one set of immigration records are found four Grays and a MacKerill, but no Norrises. All this in no way diminishes the associations we’re offering from farther north. We’re just wondering where Robert, Sr. might have met his Miss Dowling. In conclusion, with more and more historical records and registers being digitized to internet databases every day, our research continues at an exciting pace. As we said at the start, our findings here may be rather speculative, but the methodology used and correlations drawn offer an encouraging point of departure for future research. While we all can’t visit the villages of our ancestors in Londonderry County or explore the new Public Records of Northern Ireland (PRONTI) Center in Belfast, we can all contribute by searching the available databases on the internet and sharing our findings with others. That’s what we’ve tried to do here. I’m interested if any MacKrell’s/etc. have done a DNA test. Family records tell me that my 2nd great-grandfather was Robert Campbell McKrell, born c. 1860 in Pittsburgh. I’ve deduced from numerous sources that his father was John MacKrell, born c. 1826- died 1881 in Pittsburgh. John’s father’s earliest records show him to be James MacKeral, born c. 1790 in Ireland. He is buried in Allegheny Cemetery in Pittsburgh, a few blocks from where I live today. So, I’ve done DNA on several sites. Has anyone else? As you can see from my article, I don’t have much hard information on our family that far back and so finding a foothold has been difficult. Thanks to your leads I’ll try again and let you know what I find, if you’ll please do the same. I’ve not taken the time to do any DNA testing, but perhaps someone in the family will see this and be inspired to have it done, then report to this site for all to see. Finally, it’s interesting that you mention the grandfather with the middle name Campbell. That’s my grandmother’s maiden name, also from West Deer, i.e. Campbell Road. I wonder if there’s a possible relation there? Click on “Gray” and then “Campbell” under that to see if anything looks familiar. I too have Mackrell family in Maghera. My GGrandfather was John Mackrell, born in Bellaghy in 1874. Settled in Pittsburgh in 1892. I know he had an older brother Thomas and a sister Sarah, but don’t know if they came to the US. My GGGrandparents were Thomas Mackrell and Caroline Bowman. 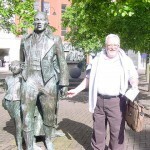 I have searched under many spellings as well, but my father once told me that his Grandfather (John) told him about his surname…”it’s just like the fish”…I am lucky to be traveling to Norther Ireland this summer in hopes to get some answers as well. How nice to hear from you. I still have many questions about the Mackrell and Norris families of Northern Ireland. I do hope you can shed some light on our common ancestors in Maghera upon your return. Thank you very much for sharing. Hello. My maiden name was Mackrel. My father was Thomas, and his father was Jimmy, I think. They lived in Castledawson, County Derry. Grand-dad owned a local butchershop. Mum, Dad, and family lived in Bells Hill, Castledawson. Any relation to you family in Maghera? It seems to me I recall having run across a McCrellias or McCrellis Gray in a census record somewhere…perhaps Indiana? and not sure what year. I had wondered what connection there might be to my family. My ancestor, james McCrellis/McCrellias/McCreles, etc., was born ca. 1780 and came to America in Jun 1798, at the time of the Ulster Rebellion.